Let’s step back to the first week of April 2009. 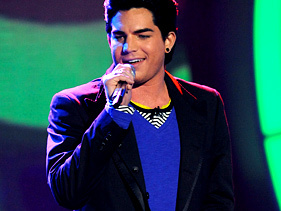 It was Top Downloads week on American Idol and Adam Lambert gave us Play That Funky Music by Wild Cherry. Where were you in the fandom? Were you checking out the Idol Blogs yet? Were you chatting with any other Glamberts online? Heck, I don’t think we were even called Glamberts yet, were we?! We certainly knew from the way Paula Abdul was on her feet dancing during Adam’s entire performance, she was already a huge fan! Does anyone know who Adam’s friends were that were in the audience on either night? When Ryan Seacrest started announcing the results in the end of this video, even though I fully knew what happened, my heart started beating just a little faster, wondering if he makes it through! The guest on American Idol that night was none other than Lady Gaga singing Poker Face. This may have been the first time many of Adam’s fans had seen her. I haven’t seen this performance since the original broadcast and WOW! I’m blown away! We can only imagine how thrilled Adam was watching this from the sideline. In addition to having Adam as a contestant, I think having guests like this also started Idol on the road to no recovery. After Season 8, it was all downhill. On this night, we said goodbye to Megan Joy. And we started looking forward to the next week, not knowing how it would change the music world forever. Stay tuned! I really loved this. Thanks. I loved Lady Gaga’s appearance as well.